Along For The Ride – He Said What?! 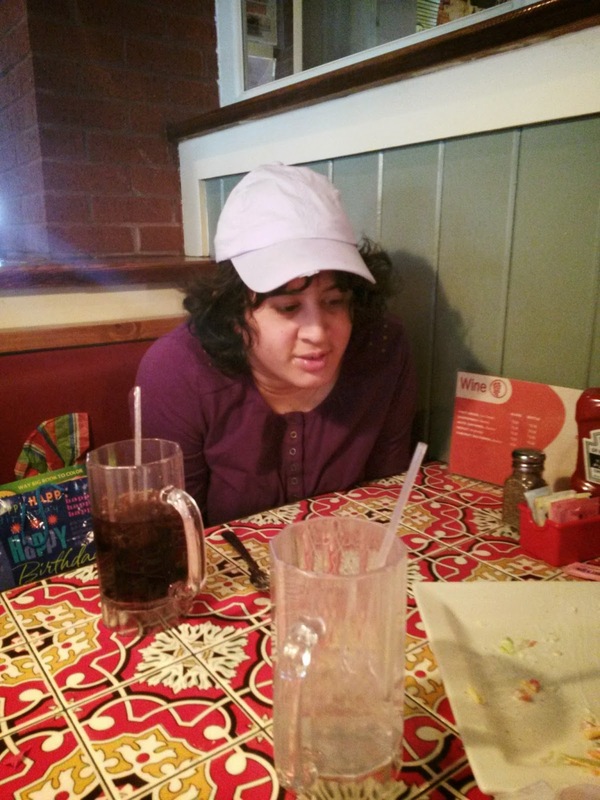 I wanted to post a quick blog about our dinner yesterday at Chili’s. 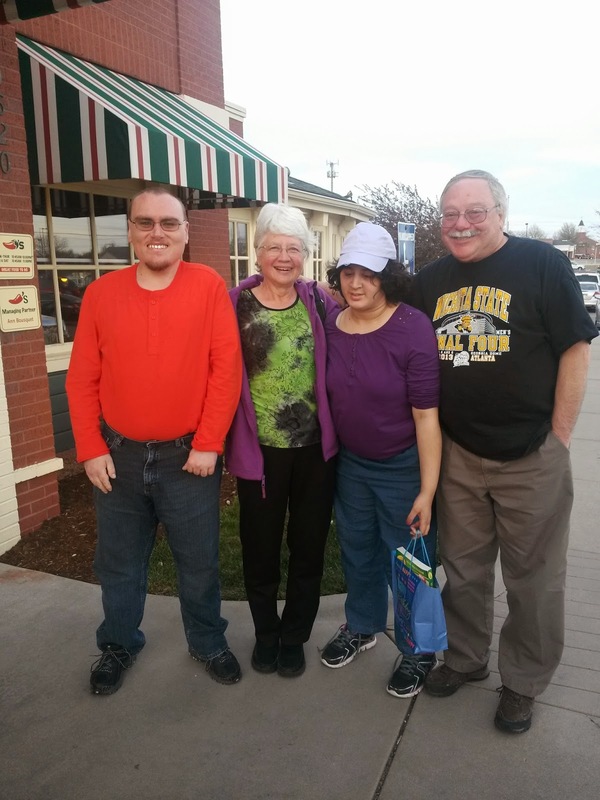 We had dinner with Aaron’s special friend, Rosa, whom Aaron calls Rosie………so we do as well…….and Rosie’s parents, Leroy and Louise. It’s really sweet to hear Aaron’s name for Rosa and to see their friendship. They are friends according to their way of doing things, which is as unique as they are. It’s pretty well a loud and sometimes confusing gathering as we sit there with Rosie and Aaron. We parents can have some conversation, but it’s constantly interrupted by our “kids” as they want us to tell this or listen to that. It’s interesting and funny and with Aaron, of course, sometimes embarrassing. Why does he want to tell Louise that she looks like the old lady on one of his games? She does NOT!! Rosie grabbed her gift bag from Aaron the instant she sat down, and we laughed at her enthusiasm. She was very, very happy with the gift of crayons. Rosie ADORES crayons. She had talked to me on the phone when Aaron made his usual call from Paradigm in the afternoon, and she had asked if we were coming to her birthday dinner……..and were we bringing crayons? She couldn’t wait for those crayons, and I laughed as she asked about them. As we were getting ready to leave the house after Gary got home from work, Aaron ran back up to his room to get something. He came down carrying a wrinkled picture that he had cut out of the newspaper some time back……a picture of the Ice Age movie characters that Rosie likes. What a sweet gesture from Aaron, to have cut out and saved this picture for Rosie just because he knows that she loves Ice Age. This is one of the amazing things about gruff, rough, blunt Aaron. He loves to share with Rosie, and with other friends. Sometimes we have to curb that desire on his part because he gives away money and movies and food……….but what a sweet thing for him to want to do. 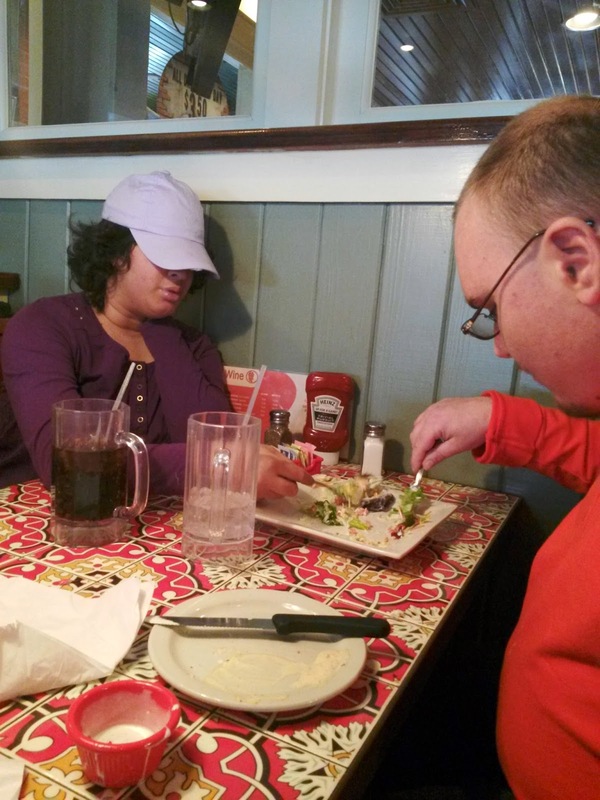 In fact, during dinner last night, Aaron got a salad……….and soon he and Rosie were sharing it. 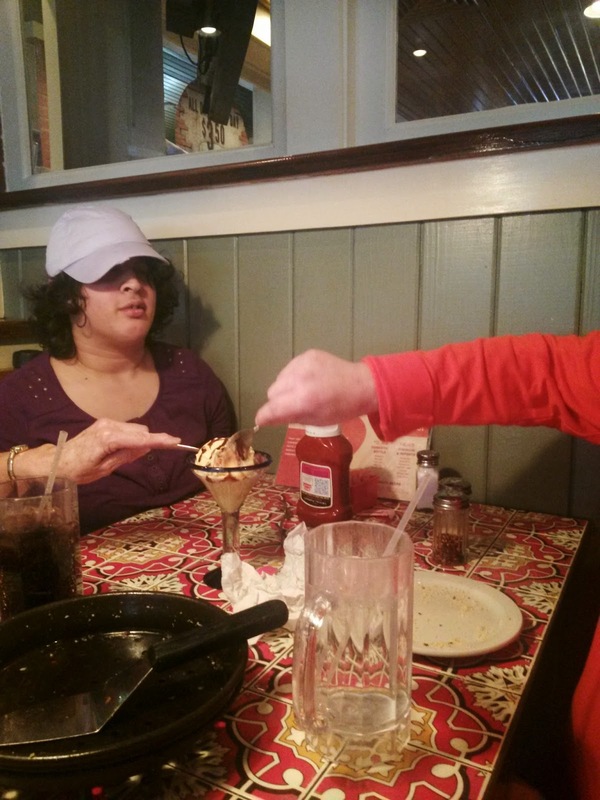 Then after dinner, Rosie was given her ice cream treat from Chili’s……..and she shared that with Aaron as well. It’s so sweet to see the two of them sharing these things with each other. But even sweeter is to see them sharing their lives, in the way that they do…….which is not always in the way that we might expect. That’s because Aaron and Rosie don’t live life the way that many others do……and that’s all right. They are so special and so individual, and make us smile and look at relationships in a whole different way. It’s really at times very refreshing. After dinner, Aaron and Rosie were both ready to go. They came to eat, and to give and receive a gift, and when that was done it was time to move on. Linger over casual conversation after dinner? Are you kidding? I was able to take a quick picture of Aaron with Rosie and her parents after we ate. The instant that the picture was taken, Rosie was off and walking at a very fast rate toward their car. Louise and Leroy laughed as we all said a quick goodbye, and they took off after Rosie. We climbed in our van with Aaron, where he talked about games and movies and anything other than his nice time with Rosie. But we know that in his own way he was happy with the evening. He, and Rosie, were just ready now to move on to point B now that point A was accomplished. It’s not always about the relationship with them as much as it’s about the event. But they value that time in their own way, and so we as parents value it as well. We do these things in Rosie and Aaron’s way, for the most part, and sometimes are just along for the ride. What a ride it is! But wonderful and sweet……….us sharing their lives as they shared their salad and ice cream. We’ll do it again in November, for Aaron’s birthday. He and Rosie have already been planning it. We’ll be along for the ride once more. Can you guys share my birthday that day as well? We would LOVE to share your birthday, Ed! Previous Previous post: What Kind of Thank-You is THAT? Next Next post: Does That Sound Indian?